Enjoy as miniature ice pops or as ice cubes for a sweet addition to a summer drink. Evenly distribute the blueberries among the ice cube trays. 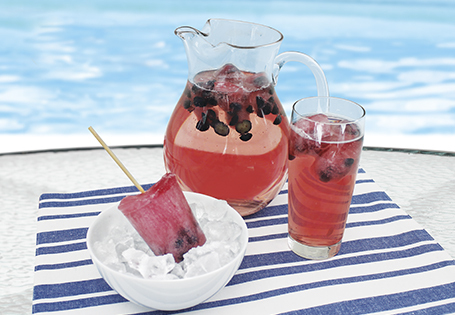 In a large pitcher, mix together the berry burst juice and soda or sparkling water. Evenly distribute the juice among the ice cube trays. Wrap the top of each tray with a sheet of foil. For ice pops, puncture the center of each ice cube mold with a toothpick. Freeze for a minimum of 1 ½ hours. Serve as a popsicle or remove from the stick and add the frozen cubes to your favorite summer drink.